Bryn Stroyke’s father was one of those who yearned for a Montana ranch to call his own. After years of searching and failed offers, one was finally accepted. But, by that point, Bryn’s father had passed away. Stroyke never forgot his father’s wishes. “My dad bequeathed that legacy to us,” he says, referring to himself and his brother, Robb. But Stroyke also knew the harsh realities involved in the upkeep and owning of a second home. Preferring a trout stream to house repairs is an easy choice for any of us. That’s where the Ranches at Belt Creek came in. Perched just outside the town of Belt, with a sweeping view of the Highwood Mountains, the Ranches at Belt Creek provided a place for Stroyke to fulfill his father’s dream and accomplish his own goal: “The goal for me was to have a multi-generational place. I have three daughters and someday they’ll bring their future families here,” he says. Bryn’s brother purchased the adjacent property, collectively called Luckyman Ranch. Aiding the Stroyke family in their quest for an heirloom-quality home were several key people: James Klippel hails from Buford, GA, where he is an artist and the Designer of Architecture at James Klippel Design Studios. Specializing in dramatic, custom, rustic, and natural homes, Klippel’s designs boast open plans, energy efficiency, and natural light. His unique work has spanned 4 decades with many domestic and international award-winning projects. Klippel arrived in Belt in August of 2013 to walk Luckyman Ranch alongside the Stroyke family and develop sketches. 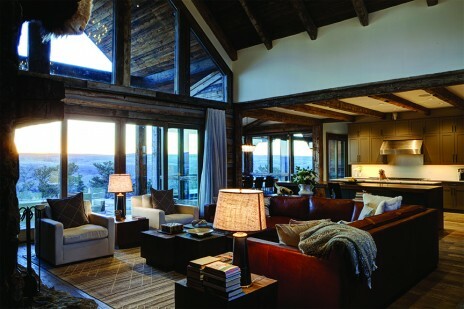 “The design concepts we did together in Montana were 90% of the final plans. Collaboratively, the family added input, making creating the design a fun and fluid process for all,” says Klippel. Matthew Pethel, of The Pethel Group, LLC located in Belt, was the general contractor and builder. 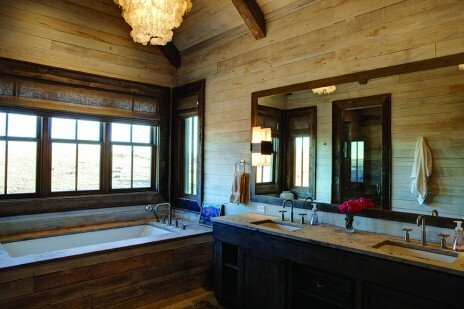 Once the plans were finalized, it was up to Pethel and his crew to painstakingly pick through piles of reclaimed lumber shipped in from Idaho and Appalachian homesteads. “The concept was a little log cabin in the living area and then the house expands out from there,” says Pethel. “These logs are twisted and warped. They’re not easy to cut! It’s not cutting a 2×4.” Pethel is used to it. 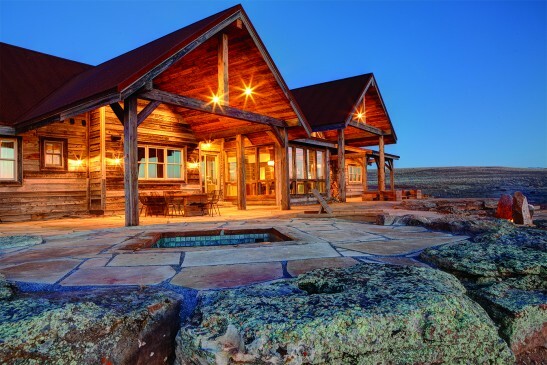 He’s been building log homes for 25 years, even for country music artists. The interior finishes and furnishings are the handiwork of Laura Fedro Interiors, Inc. She and her associates spear-headed everything from custom cabinets and furniture to lighting, wallpaper and draperies. Practicalities such as a double washer and dryer in the laundry room to a cowhide-covered bench in the mudroom (What doesn’t get muddier than a cow?!) exhibit their extensive knowledge of combining family-sized functionality and classic design. Another example is the oversized buffet separating the kitchen and great room. 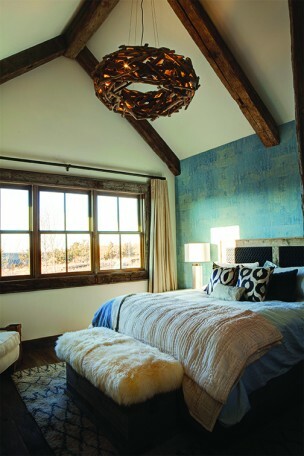 The creation of Elements Concrete in Bozeman, the piece is made of reclaimed oak dating from 1763 and has been infused with tin. The tin molds perfectly within the wood’s cracks and checks as it flows much like a Montana trout stream through the aged piece. Running your hand across the top reveals a smoothness so perfectly melded it’s as if the tin and wood had always been together. 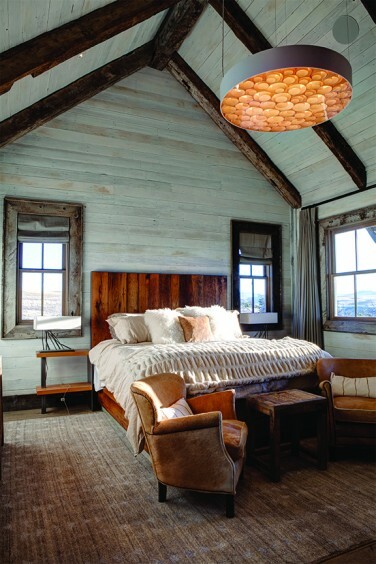 Shaw Thompson from Misco Mill in Bozeman hand-crafted all the custom beds in the house out of similarly sourced reclaimed lumber, providing an interesting mix of traditional materials with a contemporary bent. Stroyke concludes, “I wanted there to be authenticity. From the beams to the floors, it’s all reclaimed. The great thing is, year after year after year, it just keeps aging.” And that’s what makes this house the perfect family legacy.